An Auth-Only transaction is a pre-authorization of funds. This means that the funds are not actually deducted from the card holder’s account but are reserved for a specific transaction. Some examples of Auth-Only transactions are appointment reservations or products that are not provided directly after the sale has taken place (such as back orders). Please Note: Use caution when processing Auth Only transactions. When you process a transaction as auth-only, the pre-authorized amount is reserved and limits their available balance. The transaction will not be finalized until it is captured. Auth Only is similar to entering a Simple Charge transaction. You may manually enter the customer’s credit card information or swipe the customer’s credit card. To swipe the customer’s credit card, click 'Swipe'. Swipe the customer’s credit card when you see the ‘Please Swipe’ window. 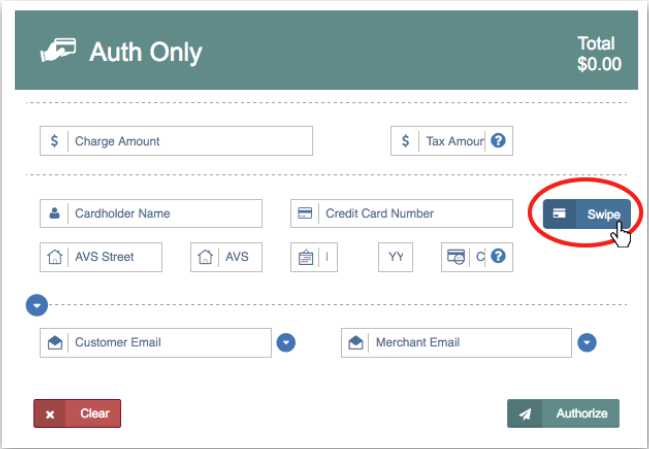 When manually entering a customer’s credit card, the required fields to process an Auth Only Charge are: Charge Amount, Credit Card Number, and Expiration Date. The Cardholder Name, Tax Amount, AVS Street, AVS Zip Code, and CVV fields are all optional. To email the receipt to the customer, enter their email in the ‘Customer Email’ field. To send a report of the transaction to your email, enter your email in the ‘Merchant Email’ field. To reveal the additional fields (Company Name, Customer ID #, Invoice #, PO #, Order ID, and Description), click the drop down arrow on the top left side of the ‘Customer Email’ field. Once all desired fields have been entered, click 'Authorize'. A pop-up window will appear with one of three responses: ‘Transaction Approved’, ‘Transaction Declined’, or ‘Error’.